The Giants signed him as a third baseman, but he never made it to the majors with the Giants and was later picked up by the Chicago Cubs in the Rule 5 draft. The Cubs decided to switch him to second base and he was 22 years old when he made his big league debut on April 15, 1958, as the new double-play partner to National League MVP Ernie Banks. Tony played nearly flawless in 1958 and was named to the all-rookie team at the end of the season. 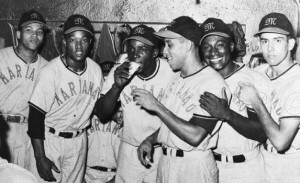 Established as a solid major league infielder, he was hitting .313 after 60 games of the 1959 season. On June 18th, he was hit under the eye by Pirates right-hander Ron Kline and carried off the filed on a stretcher. He returned to the lineup the next day and proceeded to collect hits in 10 of the next 11 games. 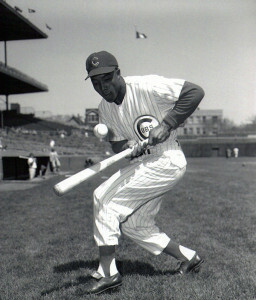 Nineteen games into the 1960 season, the Cubs traded Tony to the Philadelphia Phillies, along with catcher Cal Neeman to the Phillies for first baseman Ed Bouchee and right-hander Don Cardwell. Tony says he cried when he learned he had been traded, he was ready to quit the game rather than report. Lucky for the Phillies, Tony didn’t quit. He immediately became the Phillies’ regular second baseman. Tony made the All-Star team later that summer and became a fan favorite at Connie Mack Stadium. For the next ten seasons, Tony was a fixture in the Phillies infield. In 1963, Taylor hit .281 and collected career-highs in runs (102) and hits (182). In 1964, he made a great defensive play on Jesse Gonder’s 5th inning liner and saved Jim Bunning’s perfect game against the Mets at Shea Stadium. His best year with the bat was 1970, at age 34, when he posted a line of .301/.374/.462 (the team hit .238). Fondly remembered for his hustling style, team-first mentality and slick fielding ability, Tony would cross himself every time he came to the plate. 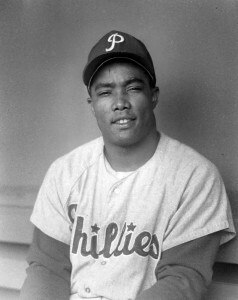 He collected more than 100 hits in ten different seasons as a member of the Phillies. With 2,195 lifetime major league games, Tony ranks high on the list of major leaguers who played the most games without ever appearing in the World Series. He was was also a dangerous base stealer, swiping 20 or more bases in six different seasons. He stole home six times. At age 35, Tony was a member of the 1971 Phillies team that moved into Veterans Stadium, pinch hitting in the first game at the shiny new ballpark. 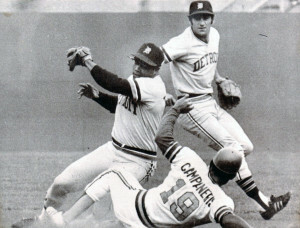 A few months later, he was traded to the Detroit Tigers and he helped them win a division title in 1972. Before the 1974 season, he joined the Phillies again as a valuable utility man and pinch hitter for his final three major league seasons. When he retired following the 1976 season, he ranked #1 in Phillies franchise history in games played by a second baseman (1,003). Following his retirement as a player, Taylor coached for both the Phillies and Marlins. Still one of the most popular Phillies ever, he was inducted into the Philadelphia Baseball Wall of Fame in 2002.